From the moment sports became more than just a way to enjoy physical prowess and watch others do incredible things, people have looked for ways to make money off of it. This is not to say that sponsorships are a bad thing, as it has mutual benefits between athletes, the organizations, and the businesses paying for notoriety. From Pepsi and Microsoft for the NFL to Coca-Cola and Nike for the NBA, major businesses have taken part in the growing success of major league sports promotions for decades. Independent and minor league organization also have their fair share of sponsors as they grow in name value. Just try sitting through Hickory Crawdad’s baseball game in North Carolina without being bombarded with advertisements from Lance, O’Reilly, and Bud Light. Yet despite how much we know – consciously or not – about how advertising in sports work, there’s still one sport that has its fair share of debate in minor and major leagues: MMA. Mixed Martial Arts (MMA) is a collective style of various striking and ground-based martial arts which has risen prominently as its own sport over more than twenty years. The most well-known MMA organization is the UFC, where names like Conor McGregor and Jon “Bones” Jones are known from playgrounds to bartop discussions. The UFC used to be open to various types of sponsors for its fighters (who could forget TapouT, Xyience, or, infamously, Dude Wipes) but that changed in 2014 when Reebok become one of the sole sponsors of the brand, implementing the commonplace uniform system they still rely on today. Smaller professional organizations like Bellator have been able to allow for open sponsorships for the brand and its fighters with varied success, and One Championship in China enjoys company-wide deals with Sony and Under Armour. However, when it comes to organizations with lower name values (such as your amateur fight leagues), how do they earn a profit beyond gate sales while boosting up their own notoriety? The answer is simple: by attracting local businesses. What’s the first thing you think of when you hear “small business?” You probably have images of upstart entrepreneurial businesses, diners having grand openings, and perhaps a few niche stores selling obscure items. If that’s your first thought, it’s time to adjust your mindset, as local businesses encompass everything from bookstores to restaurants to coffee shops to sporting goods stores and more. They are synonymous with the town they market in and are often responsible for sponsoring community events and charities. With such a strong influence on the citizens in these small towns and cities, why are they not a major part of one of the most popular rising sports in MMA? Unfortunately, it is perhaps due to the stigma attached to MMA. While it is legal in all fifty states, it was only three years ago that it finally became legal in New York, and prior to that other states had to justify its existence against the premise that it is “too violent.” One of the main methods of legalizing MMA in the United States was explaining its economic value, especially in regards to attracting paying customers from surrounding areas. The power of the mighty dollar proved well enough on the large scale, but can it be used for businesses looking to tie themselves with other organizations? To examine this, it’s best to look at Chosen Few FC, an MMA organization based out of Madison, Wisconsin that is exploding in growth in the Midwest. With over 3,000 followers on Facebook since its inception in 2014, their brand, ran by former fighter turned promoter Josh Sterry, continues to reach out to new fans after every event. When you look at their sponsor list, it is loaded with fifteen sources of exposure – all local. Chosen Few FC’s marketing is pretty clever: get into contact with different radio stations that have a diverse audience (94.1 WJJO is solid rock while 93.1 JAMZ is rhythmic pop), connect with small and large businesses in the area who want to gather new customers who may have crossover appeal with their product, and, most importantly, establish their promotion as a member of the community. For example, Chosen Few FC’s latest event, CFFC 16, two of the promotion’s fighters were dominant in their performances. 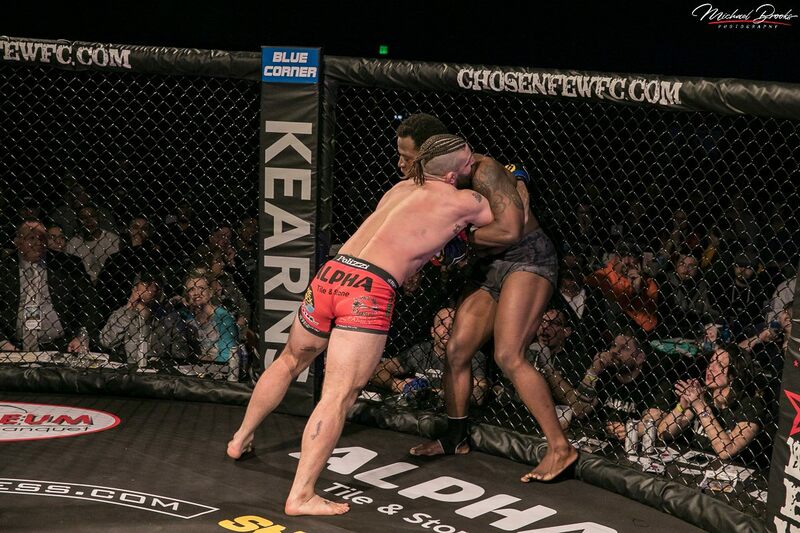 Alex Polizzi defeated his opponent Cedric Savage by TKO in the second round (a prediction analysts such as 1st Warning MMA Report did not see coming) while Dante Schiro also defeated his opponent, James Conway, by TKO in the second round (and earning Finish of the Night Honors). Both fighters were sponsored by Alpha Tile and Stone, a ceramic tile and stone distribution company with customers across the United States and Caribbean. Polizzi and Schiro were able to connect their success to a large business, who in turn connect their popularity to two rising fighters. Perhaps their biggest accomplishment as a brand and as a staple of the Wisconsin community is having CFFC’s own Alex Giplin be featured on UFC President Dana White’s Contender Series, a showcase of upcoming talent who have the potential to be UFC superstars. With exposure to thousands of subscribers on the UFC’s Fight Pass streaming service, Giplin became a figurehead for the promotion and demonstrates the value in putting financial backing behind brands outside of UFC, Bellator, or One FC. Other fight promotions can emulate Sterry’s approach to sponsorship and grow their own brand through local businesses. Such businesses can also benefit by attaching their company to successful fighters who will work through the ranks to join higher organizations. As with all things, more exposure for brands like Chosen Few FC means more opportunity for larger businesses to knock on their door asking for a piece of the promotional pie. As mentioned earlier, the UFC started with startup companies and niche product lines, but as the company expanded to the point of fighters becoming household names, larger businesses like Bud Light and Harley-Davidson were added on. Larger businesses mean larger exposure and more audience crossover. Yet it all starts with the handshake between a fight promotion and local businesses. The next UFC superstar isn’t born ready to join the company. They need to acquire their skillset, identity, and exposure through smaller organizations who need the backing of local business owners. Organizations like Chosen Few FC can be used as the barometer for how a brand can build an identity with their community and eventually become popular enough to perk the ears of high-level promotions like the UFC. Success stories like CFFC’s Alex Giplin are not typical, but by having the support of the community, the fight promotion, and the local businesses they can one day become the norm for the next feature star on a UFC card. Special thanks to the Wyndham Garden Madison for the hospitality in their family-friendly convention facility and hotel (10 stars ). Message me at cmartindirect@gmail.com if you are interested in sponsoring an up and coming MMA event.